When it is humid, denim shorts, easy dresses and overalls become my go-to outfits and I sometimes aim for monochromatic looks like the one on this post. White on white is always refreshing on hot summer days and this madewell overall is an absolute favorite of mine. I wore the overall while on vacation in Punta Cana; the front pockets and side zip are some of the details I love and for this post, I paired it with a fun bell sleeve crop top. The top is a versatile statement piece which I wore last Sunday with high-waist pants as shown on my Instagram. 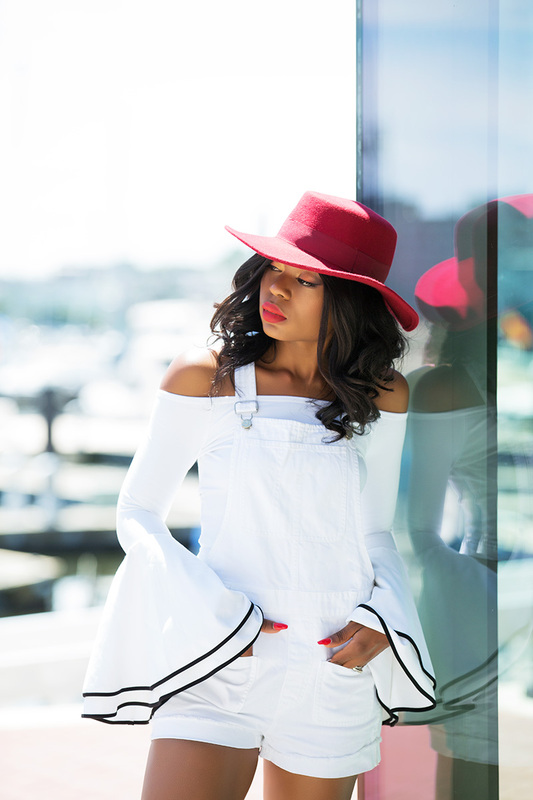 For a pop of color, I added a red brim hat and completed the look with Zara bow slides. I always choose white outfits to prevent from sunshine in summer. I've never worn white on white, well, except for traditional outfits.